"In his youth he signed his name Yukov Ettlingen, Yukov being an affectionate cognomen for Ya' akov (Jacob) and Ettlingen, the name of the small town in which his forebears had at one time resided and from which the family surname was probably derived. It is in this form that his name appears in his first published work, Bikkurei Ya'akov [Altona, 1836]." She further reveals that critics of Bernays challenged the fact that he had received rabbinic ordination. 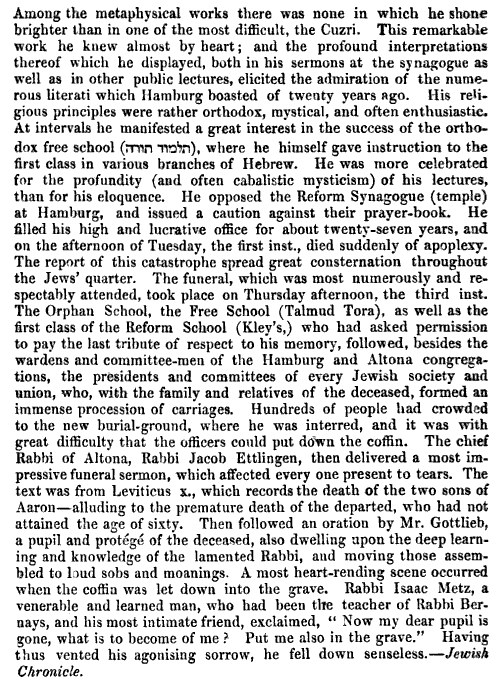 In an article in the Allgemeine Zeitung des Judentums of February 26, 1842 an anonymous correspondent relates that in the 1820s "a satiric limerick regarding Bernays mocked his usage of the title Hakham rather than Chochom in light of the fact that Bernays had neither adopted the Sephardic pronunciation nor had he received rabbinic ordination. Note: Bernays had in fact received semicha from Rabbi Abraham Bing, same as Rabbi Ettlinger. Bleich notes that Bernays was recommended for his rabbinic post in Hamburg by Rabbi Bing, and in addition he served as dayyan in Wuerzburg during Bing's incumbency. Thus, the charges that he never received ordination must be pure fabrication, although there is no documentary proof of his ordination extant. The issue itself reminds me of another one which occurred only a decade later in the United States. 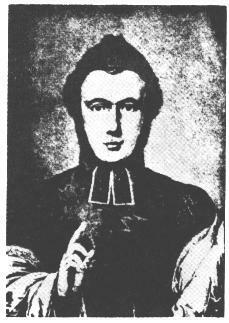 In the 1850s a bitter war of words raged between American Reform Rabbi Isaac Mayer Wise and indefatigable and archetypal spokesman and teacher of American Orthodoxy, the Reverend Isaac Leeser. Wise "smeared" Leeser as never having been ordained. Leeser, however, had never claimed to be ordained, and freely admitted that he wasn't. However, he countered, Wise claims to have been ordained by Prague's Chief Rabbi Solomon Judah Loeb Rapoport. Where was Wise's certificate of ordination? Wise never did, and maybe never could, produce it. Apparently I. M. Wise was in the habit of challenging the credentials of rabbis he didn't like. When he questioned whether my great-grandfather, Rabbi Dr. Philipp (Hillel) Klein, had a genuine doctorate, the latter replied, "In order to save you from error, I am enclosing herewith a copy of my diploma, in which I take but a modest pride. There is but one title that I bear with a conscious pride, and that is Hillel HaKohen." I like the way that the Hakham Bernays is described as issuing a "caution" against the Reform prayer book. That's such a nicer term than "cherem." There is a plausible reason why Bernays would have preferred "Hakham" to "Chochom." In the Ashkenazi pronunication, to call someone a "chochom" is hardly a compliment. Could be it was just me, but I didn't know about his reputation as being a great ba'al dikduk (of the old school). But it's interesting that here we see an edition of דרכי הניקוד והנגינות by R Moshe Hanaqdan published by the great masoretic scholar Salomon Frendsdorf dedicated to Bernays, his rebbe (whom he comes close to calling "Admor," אדמ"ו מהור"ר, quaintly from our perspective). Why was Mendelssohn so bad again? Meeting Rabbi Shmuel Salant in 1909. Sabbath keepers, and converting counts.